by Andrew Koppelman, Harvard University Press, 2013. 256pp. Hardback $55.00. ISBN 978-0-674-06646-5. In a sense, the title of Andrew Koppelman’s brief book says it all. His is a work of advocacy as much as it is of scholarship, with the author quickly reviewing the intellectual landscape – both judicial and academic – in an effort to explain and justify the doctrinal status quo in Establishment Clause and Free Exercise Clause constitutional law. His argument seems to boil down to this: the U.S. Supreme Court has gotten it right – or, more accurately perhaps, has gotten it as ‘right’ as possible. It is a matter of expectations. Koppelman is quite candid about all this. He claims his book “describes and defends present American law” (p.13). He labels it a work of law and political theory (although the larger part is political theory focused on legal analysis). On page one, he begins with the assertion that “[t]here is … a logic to the law that its critics have not understood.” If “properly understood”, this logic would “resolve the deepest puzzles in contemporary religion jurisprudence” (p.5). The critics of the legal status quo, here, are labeled “the religious right” and “militant atheists” (pp.1-2; also 166-67). The ideological arguments from each faction are mentioned here and there throughout the book. Often, they serve the narrative purpose of setting up the next big point in Koppelman’s argument, but he makes no effort to engage them as such. When he engages specific scholars of the field – which he does prolifically – it seems only as is instrumental to his advocacy. As advocate, of course, Koppelman need not confront the entirety of the field, just those parts which disagree with him. He does not misuse anyone, so much as discuss the conceptual flaws of others in light of the presumed correctness of his own. His task, therefore, is to explain things – as an advocate would. Koppelman’s task is to resolve, in some sense, the “establishment/free exercise dilemma” in which the abstract provisions of each clause seem to encourage government policy that is discouraged by the other clause. He tackles the specific issues of “official neutrality”, “establishment-as-corruption” and “religious accommodation”. In each case, he seeks to ground the broad wisdom of current constitutional doctrine in a liberal social philosophy that is sensitive to the growing religious diversity of U.S. society, yet one whose theoretical foundation still rest in some presumed cultural consensus. John Rawls and John Locke are cited often, although not exclusively. 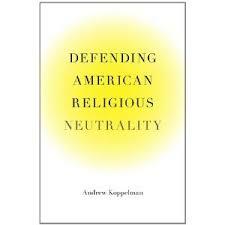 For instance, Koppelman argues that a doctrine of official neutrality in matters of religion has always been a central element in establishment and free exercise thinking; it just means different things in different eras of U.S. history. This is not a problem, he claims, if we accept a fluid approach to defining “neutrality”. He argues that this fluid neutrality “can be vague and valuable” (p.16) in guiding official decisions. “Understanding the fluidity of neutrality will not tell you what to do. It will, however, alert you to the breadth of your options” (p.25). What is fluid here? Is it the concept itself, or is it the cultural context within which “neutrality” is officially articulated? “Neutrality” does not exist in the abstract (except in academic theories, of course); in the real world, “neutrality” is a way of talking about law. Narratives of legal neutrality exist and operate within a particular context, which is to say, “neutrality” exists politically. The “fluid” part exists only in the evolving cultural contexts of U.S. society. Koppelman notes that in the 19th century, the dominant context was generic Protestantism, which began changing with the Catholic school movement and the rise of secular university social sciences. Only then did the Religion Clauses become active issues. The context evolved further into a “nonsectarian monotheism” by the mid-20th century, often termed the Judeo-Christian Tradition (pp.26-39). Each era generated its own (presumed) cultural consensus within which the more discrete legal politics of establishment and free exercise took place. Koppelman acknowledges, as he must, how some religious traditions in each era fell outside the (presumed) consensus, and he mentions how their treatment at the hands of the law was far from neutral “and at times altogether bogus, most notably in the treatment of Native American religions” (p.26). But, as a practical matter, the early routine discriminations against non-believers, well, there simply were “hardly any atheists”, and “Muslims, Buddhists and Hindus … were thought of, if at all, in the most derogatory terms.” (p.32) As Robin Lakoff (2000, pp.42-56) notes, ‘what is normal?’ is a most political question in the human condition. As Brian Tamanaha (2001) notes, law is what we talk about as law. Such “neutrality” was, of course, self-referential and therefore self-serving, and that tact will not work in contemporary society. Nonetheless, as politics and legal ideology, such a fluid view did allow the existence of an officially friendly neutrality towards the (presumed) consensus, while glossing over any cracks at the theoretical – and social – margins. Growing religious diversity in the United States, which only continues to develop, caused the transitions from one era to the next. Then again, diversity will always challenge any (presumed) consensus. As Koppelman notes, there is no longer any “shared set of theological presumptions” (p.36) upon which a substantive cultural consensus can rest; the common ground shrinks. Yet, government still needs to be officially neutral yet friendly. But, what made the ‘friendly’ part possible in the first place were the hegemonic properties of the “neutral” part of the (presumed) consensus itself. What is left, as social reality evolves, but redefining consensus? I could find little in the book that identifies or outlines a multicultural religious consensus other than that “religion-in-general” is good, and fundamental principles of establishment-as-corruption (p.49). It is unclear whether those are enough of a consensus upon which to rest any legal liberal theory. These days, then, in the absence of a cultural consensus, government must still act in a neutral and friendly manner towards “religion-in-general” (pp.45-46). Why is this ever-increasing diversity not an argument for greater separation, or even a detachment of politics from religion, as many on the left argue? Why is this ever-increasing diversity not an argument for “non-coercive endorsement” so the community-building aspects of religion will not be lost in a cacophony of religious prescriptions for the good life, as many on the right argue? Indeed, what counts as ‘religion’ in a growingly multicultural society? Fluidity seems to describe the complexity of the political problems. “Religion-in-general” only adds to them. Yet, Koppelman is quite correct in identifying how diversity challenges the claims of official neutrality. Indeed, is “neutrality” even plausible? A normal, positivist reaction is to define “religion-in-general”. Koppelman quickly reviews several such efforts later in the book (see chapter 4). At this point in the argument, he rather punts by offering (again) vagueness as a positive virtue in religious recognition. The lack of specificity might be “troubling” to some, but “no dictionary definition will do” (pp.42,43). In fact, abstract definitions may not matter, he writes, because “few cases have arisen in which courts have had real difficulty determining whether something is a religion” (p.45). Indeed, substantive concern with theoretical abstract definitions is part of the problem – and part of Koppelman’s solution. Abstractions have their place, but they must be kept in their place. It does not matter, for instance, that government neutrality in religion serves multiple social goods, or that each of those social goods is also served by non-religious activities. “Religion-in-general” serves the general social good, he writes, and as such deserves distinctive treatment under the law. The law must be religiously neutral and officially secular, but it must also operate practically (which is to say ‘politically’) in whatever dynamic religious contexts exist in society. So, “neutrality” need not justify hostility (as the critics on the right fear), although it could; nor, a super-friendly quasi-establishment (as the critics on the left fear), although it could. In this, Koppelman relies on a underdeveloped three-fold distinction between core principles, the doctrinal concepts derived from those principles, and the discrete rules of governmental conduct derived from those doctrines. Koppelman’s discussion of the establishment-as-corruption arguments is a good illustration of his contextualized logic. He runs first through the history of the main corruption arguments from the Founding onward. From these he extracts a central theme: a consistent historical fear of establishment corruption at the center of many arguments for separatism as Establishment Clause doctrine. Of course, there are many authors and numerous theories of why corruption is important, with numerous disagreements among themselves. But, this is not important. Koppelman is articulating a theory of establishment, not of corruption. Thus, corruption is a core principle (for whatever reason or reasons one might choose), and separatism is the authoritative doctrine. If corruption is made the doctrine, however, judges will eventually have to rule on whether some government program is or is not “corrupting”; the law’s positivist linguistic imperatives will kick in, which (in turn) means government officials will be discerning what an “uncorrupt” religion is, and thus the religious clauses’ dilemma is heightened unnecessarily. If separatism is the doctrine, then the core principle of establishment-as-corruption will guide reasoning, but it will not directly address conflicting constitutional claims. Separatism will do that functioning as a doctrine, which avoids much of the dilemma. Koppelman makes a parallel analysis for the doctrine requiring secular purposes for government policy: it allows religious participation and influence in government policy, but it prevents policy from being enacted in overtly religious terms. Therefore, it precludes religious arguments in subsequent litigation, and judges never confront the need to rule on claims of theological error (pp.96-98). On the issue of accommodation of religion to general public policy requirements, Koppelman acknowledges the “perennial theoretical conundrums in the law of accommodations” (p.98), while also claiming that the need for some manner of accommodation is agreed to be all (p.107). So, the question is not whether the law should include accommodations, but when and how. He advocates a balancing approach undertaken primarily in the legislative branch. Koppelman’s advice ends up being rather more practical, than theoretical: “The predominant approach, among liberals and conservatives alike,” he writes, “has been to attempt to deduce specific rules of law from these abstract provisions. No such rules can be deduced, and the attempt to do so is likely to produce mischief” (p.82). Answers to abstract questions of law are “highly context-dependent … [and] somewhat unpredictable.” Yet, “the rule at the core is clear” and allows a “religion-friendly neutrality” (pp.104,105). Outright official endorsement is banned, obviously. But, many forms of support and accommodation are still allowable. It will be, of necessity, a balancing act in setting specific policies to accomplish specific accommodation. But, this is as it should be. The expectations of expert intellectuals may demand totally coherent systems of rules and principles (into which human reality never seems to fit quite right). Like common law generally, courts will craft constitutional rules from constitutionalized principles, but legislatures will have the final word on when and how. Hard cases have arisen, and will continue to rise. Sometimes “the balance has been gotten wrong in particular cases” (p.108), and that, too, will continue. How could we expect anything different? Whether one labels this “the traditions of common law reasoning” or “legalistic muddling through”, Koppelman’s description is the status quo, after all. There is no reason to think this situation will change anytime soon. If legal and political legitimacy rests, in social fact, upon some existential cultural consensus, then ever-more diversity will only make government’s policies and programs touching (directly or indirectly) on religious activities and religious communities harder and harder to manage. The current controversy over contraception coverage requirements under the Affordable Healthcare Act for religiously devout corporations is probably the next chapter in our generations-old establishment/free exercise dilemma. Must government accommodate each and every vision of sin extant in society? How is this at all possible? Koppelman would have a response, no doubt. Any good advocate would. Yet, Koppelman’s model for religious clause adjudication does not provide a discrete answer. Consequently, his is best viewed, NOT as a technique for doing so correctly, but rather as one for doing so well – so long as we accept his essentially liberal approach. But, the critics of the status quo who do not will not evaporate in the face of his arguments. So, their claims will continue to be part of the politics and therefore part of the law. Lakoff, Robin Tolmach. 2000. The Language War. Berkeley: University of California Press. Tamanaha, Brian Z. 2001. A General Jurisprudence of Law and Society. New York: Oxford University Press.